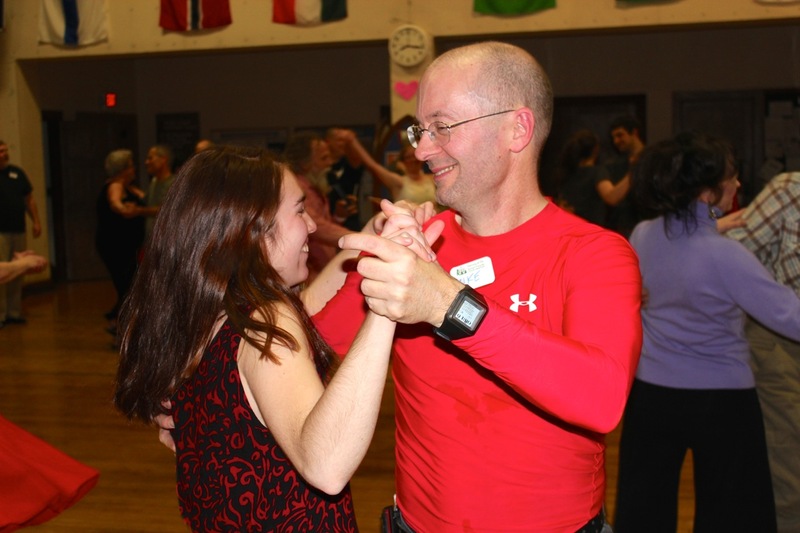 After last February's dance was cancelled due to snow, Worcester's dancers were eager and excited to hit the dance floor this February 13. We invited last year's talent to tempt fate again, and the dangerously cold weather couldn't keep them away. Myra MacLeod and her Worcester Folk Orchestra filled the hall with their melodious music, while Bill Fischer led dancers beginner and veteran alike through diverse contra calls in lines, circles, and sets. An above-average turnout left us a bit short on snacks at the halftime — but everyone was there to dance, not eat, with most dancers (dressed in red for Valentine's Day) staying until the evening's end. Even when dancing, Michael always keeps an eye on the time. Bill and Andrea go in for a swing. A custom addition to a traditional shirt. So much joy in one room. Thank you to everyone who helped us restore this wonderful Valentine's Day tradition!